WELCOME TO THE OFFICIAL PAGE OF THE BACHELOR OF ARTS IN COMMUNICATION PROGRAM OF SOUTHERN LUZON STATE UNIVERSITY! BA Communication is LEVEL 3 Reaccredited by the Association of Chartered Colleges and Universities of the Philippines. Bachelor of Arts in Communication is a baccalaureate degree program offered in the College of Arts and Sciences of Southern Luzon State University (SLSU) under the Languages, Literature and Humanities Department. It was offered following the approval of SLSU Board of Trustees on April 20, 2001 with BOT Resolution No. 304, s. 2001 through the endorsement of the Academic Council with its Resolution No. 01A-2001 on February 13, 2001. The course was offered in response to the strongly felt need to meet the challenges posed by the global, national and regional environment. It is hoped that the course will also further articulate the languages and literature departments’ recognition of communication as an important tool of education. It is tasked to develop young Filipinos the knowledge, habits, skills and attitudes necessary for active and successful participation in the economic, political, socio-cultural, spiritual and moral life in a just and humane society. Thus, the course is seen as a solution to the problem of coping up with the demand for an undergraduate degree that will prove useful, not only in pursuing the employability of its graduates, but also in enhancing effectiveness of communication as a means of helping the government to achieve its national development goals. Reflecting the institution’s vision and mission, the program hopes to uphold the truth, protect individual freedom, and advocate the management and protection of Mt. Banahaw through the different media platforms. Also, its mission is to produce graduates in the field of Communication who are competent and responsible and who are committed to work for the protection of the environment through the use of different medium of communication. The Southern Luzon State University (SLSU) team bagged the first place in the Statistics on Air: A Radio Hosting Competition held as part of the Philippine Statistics Authority’s celebration of Statistics Month, Oct. 31, 2018. The team SLSU, comprised of students and faculty from the Bachelor of Arts in Communication and the Bachelor of Science in Mathematics program, tackled the significance and contribution of tourism statistics in the growing economy of the Philippines. Geanno Ramon Zurbano and Jay Myreen Miso, students of BA Comm, served as hosts of the program. They interviewed Prof. Jed Frank Marqueses, a faculty member of BS Mathematics. Jeaniel Perez, another BA Comm student, served as the technical assistant. They were trained by Ms. Mary Jane Camarador, the team’s coach. The tandem of Zurbano and Miso, dubbed as Kuya Kiko-mambo and Ate Maya Lakwatsera, delivered a lively and informative discussion on how statistics is utilized in improving the tourism industry of the country. Miso was hailed as second best host for her excellent hosting of the program. On the other hand, Prof. Marqueses provided a clear, factual and informative discussion of tourism statistics and its practical applications. He also cited research-based examples where statistics was used to predict tourist flow and business trend, as well as to help improve the agri-business industry. Meanwhile, AMA Computer College finished second while Calayan Educational Foundation Inc. (CEFI) secured the third spot in the team competition. A student from CEFI was hailed as best host, while the third spot for hosting was grabbed by Maryhill College. Statistics on Air was organized by the Philippine Statistics Authority (PSA), and Radyo Pilipinas Lucena in cooperation with the Philippine Information Agency (PIA) and the Kapisanan ng mga Brodkaster ng Pilipinas (KBP) – Lucena Chapter. Following the milestone set by their predecessors, students of Bachelor of Arts in Communication once again proved excellence of the program in Research as two studies qualified in the Philippine Journalism Research Conference 2018. Baby Clarisse Ramirez’ paper entitled “Drugs, death, and glory: a critical discourse analysis of the news reports on Duterte and his war on drugs” was accepted in the Academic research Category-News as discourse cluster. While “KwentongBahaghari: a documentary film on the lives of selected Bahaghari members” of Kim Belard Marquez, Jethron Cyrus Lavadia and Joleen Araneta, has been accepted in the Special Project Category. Dr. Shiela Manzanilla advised Ramirez in completing the study, while Marquez, Lavadia and Araneta’s adviser is Ms. Mary Jane Camarador. This is the fourth time that researchers from Southern Luzon State University (SLSU) qualified to present in the prestigious PJRC organized by the College of Mass Communication of the University of the Philippines-Diliman, and the University of Santo Tomas. 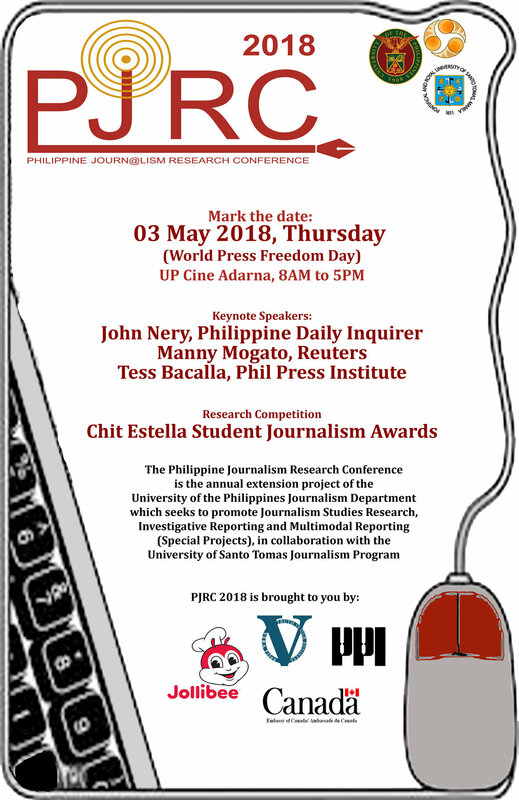 Vera Files and the Philippine Press Institute are among the sponsors. Beejay Castillo and Amiel Jansen Demetrial bagged the Chit Estella Student Journalism Award in PJRC 2015 and 2016, respectively. Immanuelle Espiritu impressed the audience with her research presentation on the portrayal of Lumad in news about Lumad killings in the first Asian Journalism Research Conference in 2017. UPDATED. Being one of only 10 chosen Universities, SLSU's BA Communication program produced the music video of the song Naririnig Mo Ba, an entry to this year's Himig Handog, a multimedia songwriting and music video competition of ABS-CBN's Star Music. The music video premiered on MYX on November 4 and is now available on Star Music Youtube Channel (see below). The song is written by Li Manzano and Joan Da, and is interpreted by Morissette. Himig Handog Finals is on November 26, Sunday. Being one of only 10 chosen Universities, SLSU's BA Communication program will be producing the music video of the song Naririnig Mo Ba, an entry to this year's Himig Handog Competition of ABS-CBN's Star Music. The song is written by Li Manzano and Joan Da, and is interpreted by Morissette. The music video will premiere on Myx and Star Music Youtube Channel on October 27, Friday. It will also be shown on ASAP for the Himig Handog Finals on November 26, Sunday. More updates to appear on this post soon. These were the parting words of Immanuelle Espiritu, a fourth year student of Bachelor of Arts in Communication in Southern Luzon State University, during her presentation in the Asian Journalism Research Conference, held at the University of the Philippines Diliman, April 25. Espiritu’s study entitled "Hunted in the Promise Land: A Discourse Analysis of the News Reports about Lumad killings" analyzed the construction of the Lumad identity, the valence, and the political context present in the online news about Lumad killings published in national online news site, rappler.com and inquirer.net, and online sites of local dailies, sunstar.com and mindanews.com. “I believe the study will serve as an eye-opener on the issue about Lumad killings and will eventually bring light on the position of the Lumads and other indigenous groups in the society. Hopefully, this may prompt media practitioners to examine the issue more critically, “ said Espiritu. Espiritu landed second in the competition by only one point from the champion who come from Ateneo de Manila University (AdMU). The researchers from AdMU studied the Visual Representations of Para-Athletes in Elite Para Sports by Philippine Print News Media and the Perception of the Portrayals by Filipino Persons with Disabilities (PWD). Espiritu competed with seven other research presenters from the University of the Philippines-Diliman (UPD), Ateneo de Manila University (ADMU), University of Sto Tomas (UST), Polytechnic University of the Philippines (PUP), Batangas State University (BSU) and University of the Perpetual Help System (UPHS). Espiritu is 10th from the left. “I am still thinking of ways on how my study can reach the media institution and possibly realize the aim of my study to bring consciousness to the reader but I certainly do not want to just let my research sit on my desk and collect dust.” Espiritu shared. AJRC, with the theme “The Fourth Estate: Revisiting the Normative Ideals of Journalism in a Multimedia Era” is an international conference that seeks to promote Journalism Studies in the Asian region. The conference was organized by UP, UST, and the Universitas Gadjah Mada Yogyakarta. Bachelor of Arts in Communication joins the ranks of six other programs in the University as it received level III re-accredited status from the Accrediting Agency of Chartered Colleges and Universities in the Philippines (AACCUP), April 17. The only Level III accredited undergraduate communication program in Quezon Province, SLSU-BA Communication underwent and passed the level III phase 1 accreditation in October 2015, which made the program qualified for the phase 2, and final evaluation to be granted the third level accreditation. The award of the Level III accreditation status is an indication that a curricular program commits itself to quality instruction to students, excellent research activities and outputs, and impact-driven extension services to the community, often higher than required by the Commission on Higher Education, and in comparison with 110 other State Universities and Colleges in the country. CAS’ AB Psychology was the first to have been granted Level III accreditation status in 2015 among the programs offered by the College. BA Communication was evaluated on March 27-28, 2017 in four areas such as Curriculum and Extension for mandatory areas; and Research and Faculty Development for areas chosen by the faculty of the program. The undergraduate program was evaluated by Dr. Angeline E. Borican of the Polytechnic University of the Philippines, Dr. Thelma T. Lanuza of the Isabela State University, and Dr. Manuel T. Corpus, the executive director of AACCUP. Dr. Mari Jane Lee, dean of the College of Arts and Sciences, presented the program’s profile including the videoprepared by the faculty of BA Comm. Prof. Brian Villaverde, chairperson of the program together with the other area chair helped in clarifying the inquiries of the accreditors. Dr. Corpus suggested that there is a need to highlight the profile of BA Comm graduates since they are the ultimate evidence that the program performed well in terms of curriculum and instruction. He also suggested that an intensive tracer study on the graduates of BA Comm be conducted including the alumni who are promoted and who received awards in their job. Dr. Borican, on the other hand, suggested that the program should conduct an impact analysis on its extension programs in addition to the studies presented by the extension coordinator. She also suggested to the CAS faculty and research unit to subject its research journal for CHED accreditation. During the exit conference, Dr. Corpus said that they will be giving recommendations not because they want to scrutinize the program but to guide it as it aspires for a higher level of accreditation.